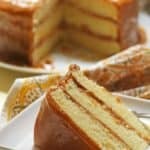 Real Deal Southern Caramel Cake Recipe – The best real Southern caramel cake recipe on the web! If you want authentic Southern Caramel Cake with the best caramel icing, you must make this recipe. It is the real deal for real. Southern caramel cake recipes have always been a classic that I could have any day of the week. 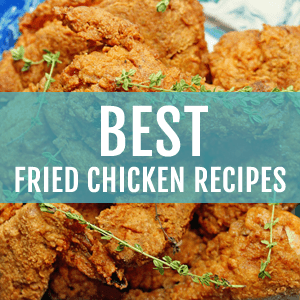 My family has made it for decades, and it is definitely an old time Southern favorite. The funny thing about this cake is a lot of people did not become familiar with it until the movie “The Help” mentioned it. After the movie was released in theaters, I saw tons of replicas of this classic cake online (definitely real deal caramel cake imitators). These recipes weren’t as authentic as I thought they should be. The real deal caramel cake imitators all seemed okay but nothing like the one I am used to eating. The classic caramel cake recipe has a moist yet slightly dense (but still light) yellow butter cake that isn’t too sweet because the caramel icing is the true star of the party. The classic southern caramel cake doesn’t shortcut the caramel icing recipe with a quick brown sugar butterscotch method, which is a caramel frosting substitution (my recipe doesn’t shortcut anything). This caramel uses granulated sugar and evaporated milk to create the luscious flavor. 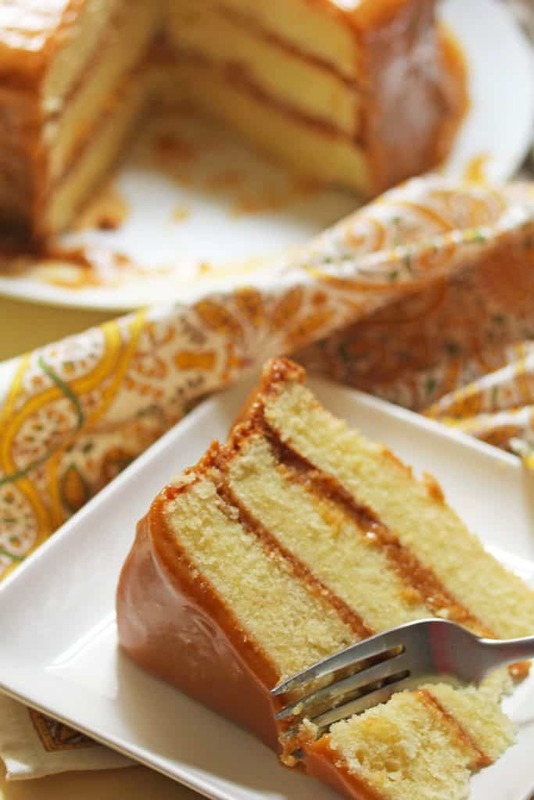 This southern caramel cake recipe is the real deal caramel cake. It puts other caramel cake recipes to shame. The caramel icing (definitely an icing and not a caramel frosting which is a bit different in texture and consistency) comes from my Aunt Bev, and she definitely gets down in the kitchen. Try this for yourself and finally enjoy the true classic! And P.S., this is not a cake you can throw together quickly. It definitely takes about 3 hours from start to finish but it is well worth the wait! Here is a look at how the caramel icing begins to come together. Some people struggle with knowing exactly how the icing should look after about two hours of cooking on a very low heat. Low and slow is the best way to achieve this perfect icing. The color will deepen and it will naturally thicken. Remember to make sure that the caramel turns the color of the photo below before stopping the heat. It should also COMPLETELY coat the back of a spoon to ensure thickness. Be careful to watch, adjusting heat temperature to not let it burn. Once you remove the caramel icing from the heat, it will continue to thicken on its own. Make sure to allow this process to happen. I like to let it cool at least 30 minutes. It will help with frosting the cake without the icing dripping everywhere and the layers sliding too much. Just a note here: If you are having problems with your cake sliding, it is because the caramel icing recipe is too thin. If you let it GET TOO THICK, just add a little bit of milk. Really follow your instincts here. This caramel cake recipe is perfect for the holidays. It is not an easy cake to pull off because as I mentioned before it can take up to 3 hours to complete the recipe. Make this caramel cake for special occasions and holidays like Thanksgiving, Christmas, or a family reunion. This cake is made with love and should be shared with those very special people in your life. 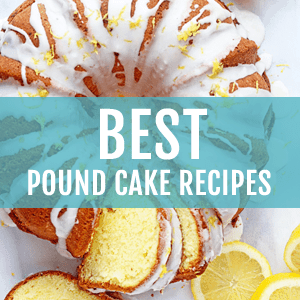 If you love this cake, you might also become infatuated with some my other holiday desserts like my Ultimate Lemon Cake, Cream Cheese Pound Cake, Brown Sugar Pound Cake and Southern Peach Cobbler! 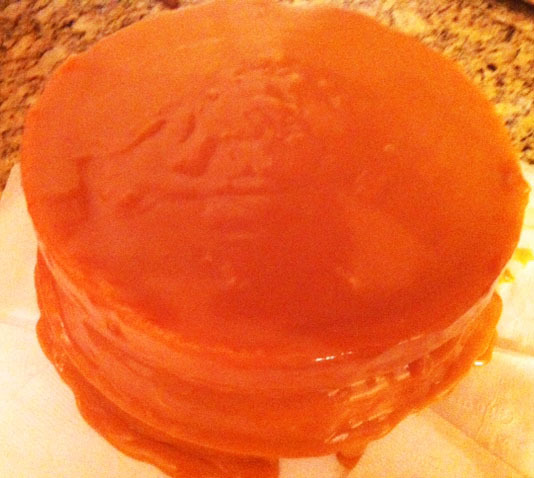 I love seeing your Real Deal Caramel Cake Recipe Creations!! Check out some of the amazing photos I have received! 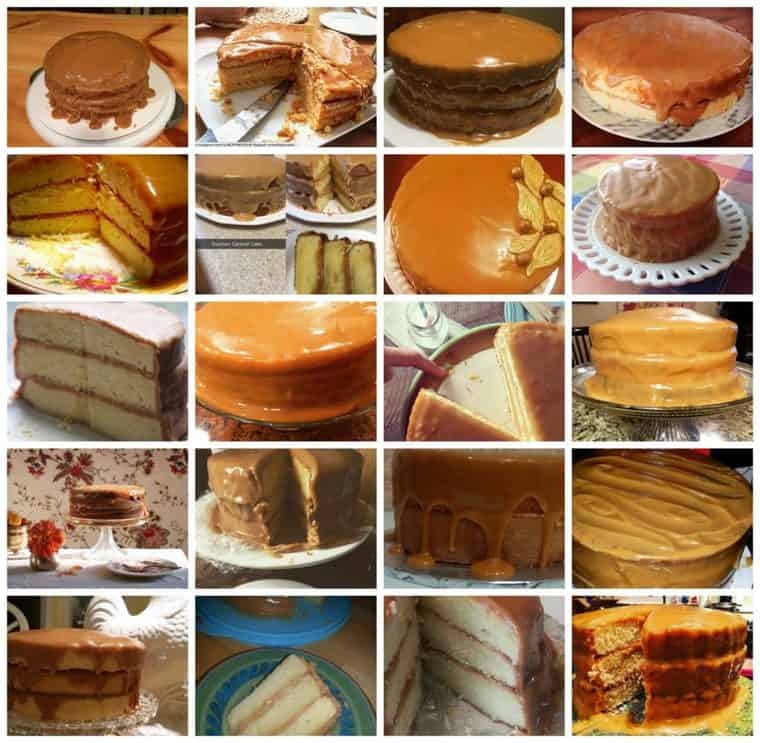 After more than five years, I must say this Real Deal Caramel Cake Recipe is still my most popular cake recipe. 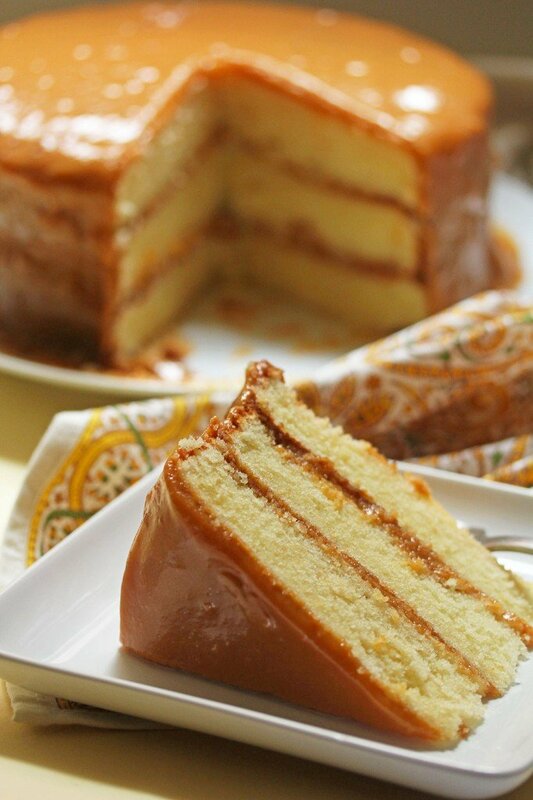 The best real Southern caramel cake on the web! 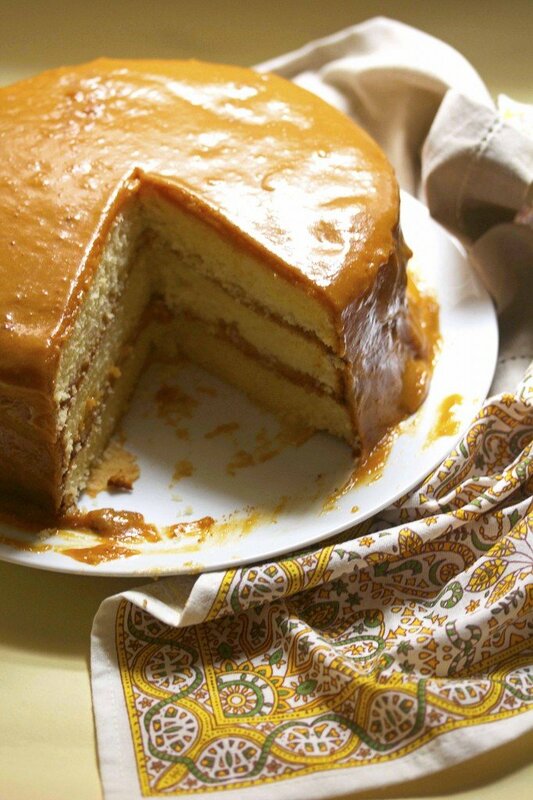 If you want authentic Southern Caramel Cake, you must make this recipe. In a large mixing bowl, cream butter, oil and sugar on high until fully incorporated and light and fluffy, about 5-6 minutes. Turn mixer to medium speed and mix in eggs and egg yolks one at a time until well incorporated. Add in vanilla extract and mix. Sift cake flour, baking powder and salt into a medium sized bowl. With mixer on slow speed, alternate adding in flour mixture and sour cream ending with flour mixture until mixed through. Spray three 9 inch round cake pans with baking spray or grease and flour them. Pour batter into individual cake pans evenly. 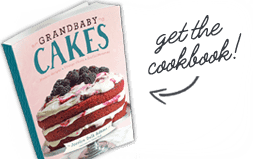 Bake in preheated oven for 23-30 minutes or until fully baked (but DON'T OVERBAKE THESE CAKES- CHECK THEM EARILER SO THEY DON'T DRY OUT). Remove cake pans from oven and cool on cooling racks for 10 minutes. Remove cakes from pans and wait until completely cooled to ice. Add butter, evaporated milk, and sugar to saucepan over medium heat until everything has melted together. Leave over medium to low heat stirring periodically for about 1 1/2- 2 hours (watch the entire time to make sure it does not burn until thickened and caramel has darkened to a beautiful golden brown. Make sure that the caramel turns the color of the photo below before stopping the heat. It should also thickly coat the back of a spoon to ensure thickness. Be careful to watch, adjusting heat temperature to not let it burn. Cool for about 15-20 minutes to allow it to thicken before icing the cake. 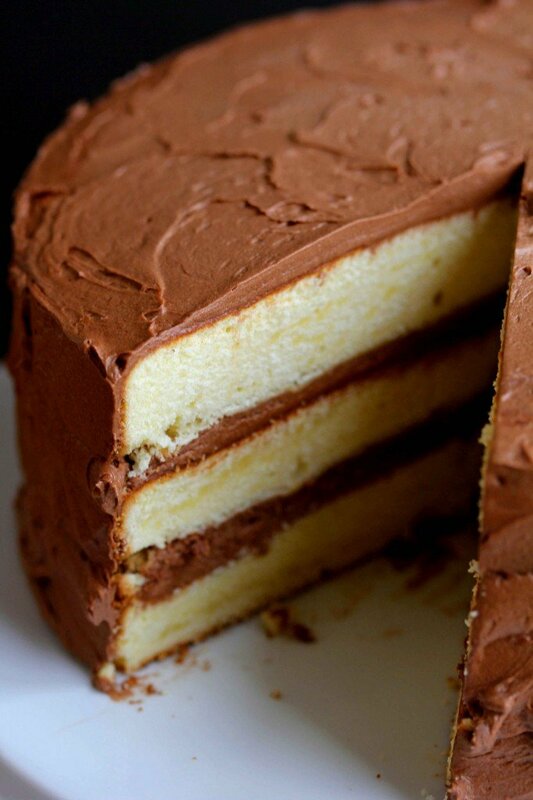 If you are having problems with your cake sliding, it is because the caramel icing recipe is too thin. If you let it GET TOO THICK, just add a little bit of milk. Really follow your instincts here. 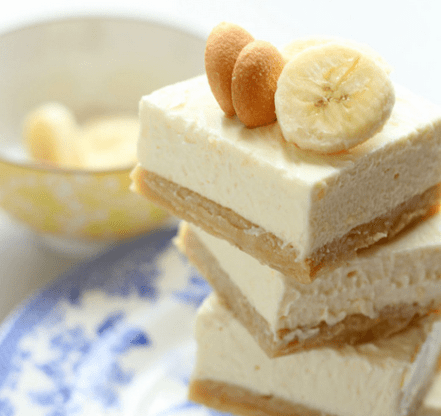 Check out my Banana Pudding Cheesecake Blondies! 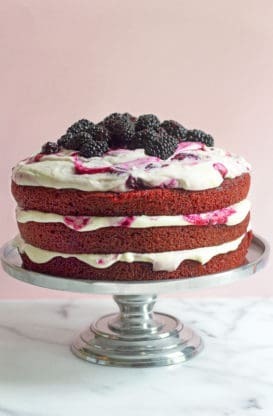 Or my Red Velvet Blackberry Cake! I am making the caramel icing right now but I started making it too late because now I have to leave for work. it was almost done though, it was cooking for about 2 hours and had thickened up but I feel it needed a little bit more time to get to the color and consistency as the video. It will be cooled by the time I get off work, can i heat it back up on the stove and continue cooking it? Thanks, absolutely delicious. I love caramel and as a kid ithis dessert was only made on special occasions. Caramel cake and coconut cake , lemon meringue pie are my favorites. This is my new go-to recipe for caramel cake. For those who are having problems with the frosting, that happens. It can be made without a cooking thermometer. The only caramel I’ve made that a needed a thermometer is for apples or candy. I’ve ruined the frosting for a few caramel cakes so it takes patience and do overs. I always whip mine after it has cooled down a bit. I found this cake to be way too dense, but reading all the good reviews, I must have made a mistake somewhere. I am a very experienced baker and reading the recipe I note it has leavening mostly from the eggs. I teas. baking soda for this amount of flour – is very little. So, maybe I need to beat the eggs more carefully. My caramel cake memories are from the Shabazz Bakery in Chicago. That cake was just a tad lighter. Thank you for a lovely website. I’m making this cake today for a friend, I can’t wait to taste it. On the cake recipe it states unsalted butter but on the icing it doesn’t specify. Do you use salted butter in the icing? You can use either. I usually use salted for the icing. Caramel cake is my hubby’s favorite, and I’d never made one, so I gave it a shot for Valentine’s Day. It was FABULOUS! He’s a hard critic to please because he has a food background and he was so proud of me. He even asked if it was hard to do because he’s going to want this on the regular. I found this cake recipe on Pinterest. I made this cake yesterday as a trial run before the luncheon. The cake is yummy but the icing is truly the star…it is so delicious! Mine doesn’t look pretty because of some of the drips but it sure tastes great! Hooray I’m so so glad you enjoyed this cake! I made this cake for the first time for Christmas dinner that we hosted at my Mom’s. My mom said this cake was best cake on the dessert buffet (that means better than her cakes too). I’m a star!! Or should I say your cake made me a star. One of my aunt’s said it tasted just like my grandmother’s. This is a tough crowd so that’s really high praise. Thanks so much for a great recipe!! Wonderful compliment. Thank you so much. Caramel cake is my favorite cake. My mother made the BEST in the wiorld,to me & my siblings.She’s no longer here,I asked several people to make it for me,they did, but it didn’t have that taste I was looking for.I found this recipe about 2 or 3 years ago on google.I decided to make it for my family Thanksgiving,they LOVED it,said it taste like our mother use to make hers.Every Thanksgiving & Christmas this is the favorite cake again.Thank You so much for this recipe.GOD bless you. Hi Gloria, you can make it ahead and then just leave it be before frosting the next day. This is exactly how my mom taught me to make caramel icing when I was younger. You just can’t beat the flavor! I know a lot of people get super frustrated when they just so happen to burn it. Believe me, even the best (including my mom) have burnt the caramel a few times and had to start over, lol. Give this recipe a try, you will not be disappointed. I cooled my caramel about 10 mins then whipped it in my mixer with a whisk attachment until it was the consistency i needed. I love this cake, it reminds me of my grandmother because she made a caramel cake every Christmas. The only problem I have is with the caramel the taste is spot on but just could not get it to as thick as my granny’s. So I put just enough icing to layer the cake then put the icing in a bowl and finished icing the cake the next morning. My mom loved it said that ” its just like momma”. Thank you for sharing. I love caramel! This cake looks so delicious! Do you recommend making icing a day ahead? I tried this recipe a couple of months ago and the cake slide 3 different ways once I assembled it. I was thinking I could make the icing and possibly refrigerate it until the next day. I icing is really good, I just wish it would thicken a little more or is there an agent I could thicken with? I’ve made this cake twice, and I found that the icing (1) naturally gets very thick, an (2) it keeps a long, long time. I made the icing in my dutch oven, and kept the remainder in the Dutch oven (tightly closed) for nearly two weeks! It tasted just as good two weeks later as the day I made it. So you can definitely make the icing a day ahead (or more!). If your cake slid, it’s either because (a) the icing was too warm, and/or (b) the cake was too warm, and/or you didn’t cook the icing long enough. This cake is absolute perfection!!! I made it for my mother’s birthday, and everyone loved it. All the flavors really compliment each other, it’s one of the best cakes I’ve ever tried. So glad to have found your recipes, greetings from Mexico!! First off, let me start off by saying I do not like caramel and I will not eat it unless snuck in with a delicious dessert. A friend requested a Caramel cake and I found this recipe. Secondly, I decided to start a cookbook of my favorite recipes just to save this perfection that is called a cake. Thirdly, I too was not able to get my caramel icing to thicken 🙁 HOWEVER. 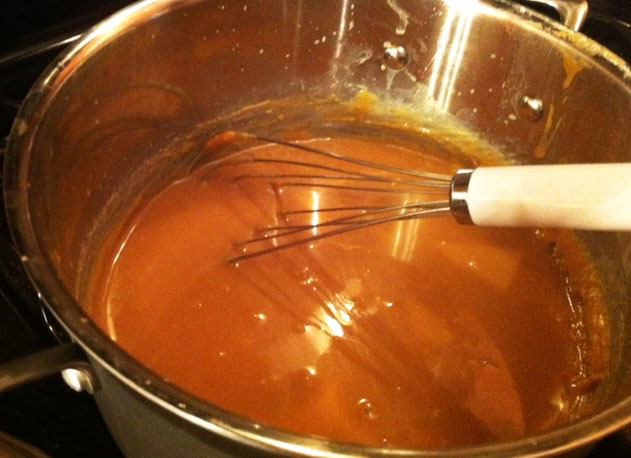 Caramel needs to thicken at exact degrees (varies for how hard you want the caramel) so a thermometer is necessary! I have an old stove that my landlord won’t replace so I was not able to get my caramel to the correct temperature to thicken hard enough for the icing. If I turned the heat on just a smidget higher, it just boiled over :/ so this is an error on my side. I will be trying the icing in my slow cooker and I highly recommend others to do so. A double boiler might even work fine, as well. I will update my results, if requested but I am sure it will work just fine in my slow cooker! This looks so good and I’m trying to find a good caramel filling for my daughter’s birthday cake this weekend. My concern is you said that the caramel doesn’t get firm, I’m trying to avoid something that is like caramel sauce as I dont want it to soak into the cake and I would like it to have a caramel texture and not just the flavor. Would you say that the caramel recipes that use brown sugar and heavy whipping cream would firm up more? Thanks! This isn’t like that and those are technically butterscotch so you will have a totally different taste. Thank you for publishing this! 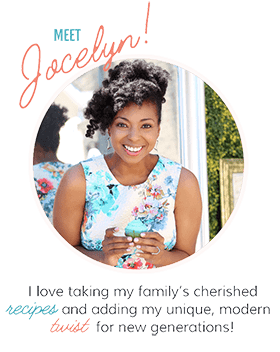 I lost my grandmother’s (Ms. Helen, Fort Valley GA) recipe and this is it! My favourite cake ever, and I’m a dessert foodie. The caramel icing is right on; old fashioned style. Awww I’m so sorry you lost it. So happy to have it here for you! It would help if there was something indicating the size of the pot. I think those of us who had trouble getting it to thicken were using a smaller pot. After 2 hours my icing was barely peanut-butter color and not at all thick. Finally I put it in a larger saucepan and turned up the heat, stirring frequently, and towards the end, stirring constantly. It has a nice consistency but to me it still tastes like evaporated milk, not like the caramel Icing my mother used to make. I think she used the burnt sugar syrup method. I guess it all depends on what you grew up with. I was making this cake for the first time for a friend. Her Mom always had a caramel cake for her birthday. I read all the comments about the cake and it turned out very well. These are my comments for a first timer. The cake does need to be watched time wise. It was very flavorful however too dense for my liking, The icing should be done in a heavy stainless pot and I found it should be slowly bubbling and watched as directed in the instructions. It really does take 1hr. and a half to thicken and brown. It needs to cool a long time before you can frost as it is very soft icing and runs down the sides. I iced the cake and had to place toothpicks all over ,covered it and left it in the fridge to harden. I then repeated icing,cleaned it up and kept it cool. Not a cake to take to a friends unless its winter. The icing and its flavor is wonderful.I used hot pink roses and blackberries to decorate. Everyone was happy including the birthday girl. If I were to make this again I would use a lighter cake but use the icing as a stable, its very good. After trying several Carmel cake recepies this is the BEST! I finally mastered Carmel icing. I baked it for my family and they loved it. I also purchased your cookbook which arrived a few days ago. I look forward to trying other recepies. This is the absolute best icing I’ve ever had. I made a caramel cake and this icing for a gathering after a funeral and it was a hit. I’m a southern woman so if you make something and it’s not good, you’ll hear about it, this got rave reviews. Thanks for sharing something so delicious. Hooray I am so so glad you enjoyed it. It is truly my fave recipe. I just made this cake and it’s FABULOUS. I followed your recipe step by step and it came out perfect. It looks just like the picture. Thank you. My 7 year old wanted a caramel cake for her birthday tomorrow. I’m ready to please. Hooray this makes me so so happy!!! I hope your 7 year old enjoys her cake!!!! Caramel cake is my absolute favorite – and I love me some cake! I found your recipe and decided to make this for a dear friend’s birthday last year [caramel cake is her favorite, too]. 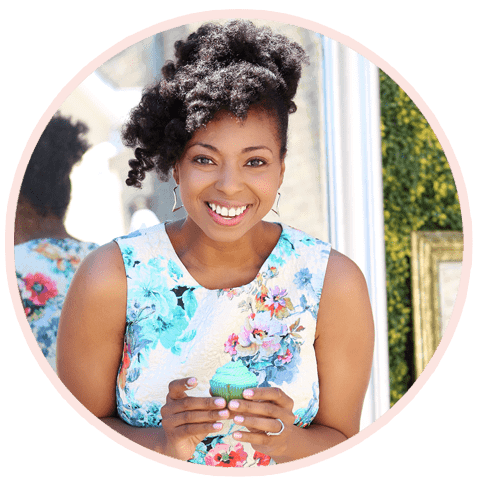 We had planned a big shindig for her out of town and your cake was the grand finale. Boy, that icing took its time to set – so, after putting together the cake, I placed it in my ancient Tupperware container, along with leftover icing, to put some finishing touches on it in case the icing dribbled off. The container was packed into the back of my friend’s car and, when she opened up her hatch, out flew the container. We watched helplessly as it somersaulted on to the ground. I couldn’t stop laughing – I had been so careful in making that precious cake only to have it land upside down! God bless that Tupperware seal – nothing was lost, just shifted. I used the extra icing for the bottom of the cake and it was a huge hit! It really is the best caramel cake I’ve ever eaten. Next time, I might try making it into a trifle – a little easier on my nerves! P.S. Your youtube video is adorable! Oh my, this looks absolutely delicious!